One of my goals in life (and through the blog) is to always live with compassion and inspire others to do the same. But in full disclosure, some days I do better than others. If you are reading this post, I am going to assume that you also love animals and want to help them live healthy, happy, and safe lives. But maybe you are short on time, money, or energy and aren’t sure how you can make a difference. It’s easy to get overwhelmed and feel defeated in the face of pet overpopulation, homelessness, and cruelty. To combat these feelings, I decided to compile a list of simple yet impactful ways to help animals. 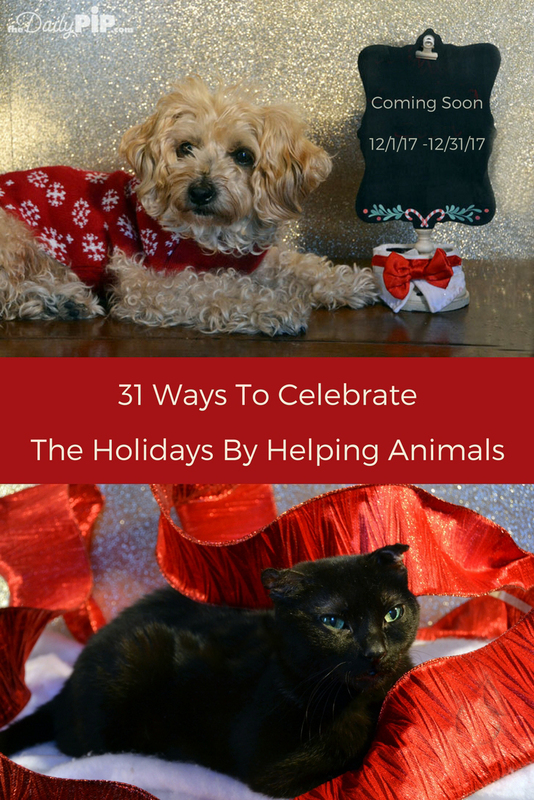 31 Ways To Celebrate The Holidays By Helping Animals is a reminder to myself that little things make a difference – small changes lead to big changes, kindness matters. I will be posting one of these tips on social media every day in December – kind of like a virtual advent calendar (only 31 days) filled with cuteness and fun, feel-good ways to improve the lives of our furry, feathered and scaly friends. You can try one or all of these tips – or you can just read along and enjoy the cuteness. 1. Adopt a homeless animal from a shelter, breed rescue, or right off the street. 2. Help seniors or other homebound individuals keep their pets. Volunteer to walk dogs, clean cat boxes, buy pet food, take pets to the groomer, or set up automatic delivery from an online pet supply source. 3. Build shelters for feral cats in your community. More information is available here. 4. Volunteer to take holiday photos of adoptable animals in shelters and rescues. Share them widely on social media. 5. Switch to cruelty free cosmetics and cleaning products that do not test on animals. I like Leaping Bunny’s list. 6. Share your pet’s rescue story on social media to inspire others to adopt. 7. If you see something, say something. Always report cruelty, abuse, and neglect to the appropriate authorities. 8. Deliver food, collars, and blankets to homeless pet owners in your community. 9. Never leave your dog unattended outside stores, restaurants, etc. If you see a dog left alone, keep an eye on them until their owner returns. 10. Set up a pet food pantry in your church, school, or synagogue. 11. Provide hospice foster care for a sick or senior shelter animal. 12. Keep an extra leash, collar and some food in your trunk in case you find a lost or stray dog or cat. 13. Host a holiday party and ask guests to bring a donation for a shelter or rescue. 14. Make humane shopping choices. Do not buy products or support companies who exploit animals, use fur, etc. 15. Participate in animal transport from overcrowded shelters. 16. Be a secret Santa and buy items off a shelter or rescue’s Amazon wish list. 17. Reduce your consumption of animal products. Go meatless on Monday or fish free on Friday. 18. Know the issues and get involved at the local and state level. Follow and advocate for humane legislation in your community and state. 19. Donate time, money, and your skills to organizations working to help animals. Volunteer to walk dogs, socialize with cats, clean cages, whatever it takes. 20. Deliver pet food to your local human food pantry or soup kitchen for low-income pet guardians. 21. Drive with animals in mind – watch out for wildlife. Keep phone numbers for local wildlife rehab in your glove compartment. 22. Thank shelter workers (who often don’t get holidays off) with gift cards, cookies or other holiday treats. 23. Sponsor an endangered animal from World Wildlife Fund or another conservation group. Symbolic adoptions help fund restoration work that save wildlife. 24. Host a vegetarian or veggie-friendly holiday feast. 25. Plan a movie night or couch potato day with your pets. Watch dog or cat-themed movies curled up with your best friend. 26. Teach your children (and their friends) to respect, be kind and safe around animals. 27. Make an emergency plan for your pets. Make sure they are micro-chipped and have tags with address and contact information. 28. Read lost pet signs and help lost animals find their way home. 30. Plant a native tree, restore wetlands, or clean up your local beach. Habitat destruction is the biggest threat to wildlife. 31. Be the person your dog or cat thinks you are! In their eyes, you are perfect, successful, smart, kind, supportive, beautiful (inside and out), funny, strong, patient and amazing – all good things to aspire to in 2018. Please follow us on Facebook, Twitter, and Instagram for daily tips on ways to celebrate the holidays, live with compassion, and help animals! Please share your thoughts on kindness and ways you help animals in the comments. This sounds like a pawsome series! Einstein is gorgeous! We hope he gets his perfect forever home for Christmas! Excellent idea. All 12 of my cats either showed up in my yard or came from the shelter. Who could resist a kitty called Einstein! Rosie, you are beautiful sweetie! Such a wonderful kick-off post and thanks so much for sharing Einsrein, we really appreciate it!!! We hope Einstein and other animals find their homes for Christmas and always. What a fantastic idea! Back when I met Bear, I had my Mom's voice in my head. My grandparents had a farm – and quite often we'd visit to find a mom cat had recently given birth. My brother and I always begged to take one home – but my Mom always said we didn't know where they were from – there were too many unknowns and they'd probably be sick. For years, I kept that in mind. Then I met Bear and the unknowns didn't seem so daunting. I'm so glad I challenged my fears to find that it was more than worth it to take a chance on a homeless kitty. I wasn't sure how he'd adapt to being indoor-only – but there wasn't so much as even a hiccup with the transition! Four paws way up to you for putting together this series! As the saying goes, "You can't buy love, but you can adopt it!" What a great series! We're purring for Einstein…and all the other shelter animals…and hope they find homes for the holidays. We hope Einstein finds a forever home. Thank you for using your platform to share such a special message. We are praying for Einstein. You are doing a great thing with these blogs. Agree 100%!!!! "Small changes lead to big changes, kindness matters." A wonderful message for Day 1! This is a wonderful idea. My husband and I rescued many animals, usually from the streets. They were mostly wonderful dogs, cats, birds even. There were a couple that had serious issues from abuse; they loved us, but needed to be watched with men and one with the vet. We married later in life and had no kids, so helping animals in need helped us as much as we helped the pets. I love what you are sharing here. What a great idea! I can't wait to read, apply and repeat next year when we have kids! Love these suggestions. It doesn't take much to help those in need. What a great list – which reminds us that we NEED to have a movie and popcorn day SOON! Thank you Thank you Thank you for posting this list!!!! There are a number of items that you listed that are OF COURSE that would be great, that I just never thought of!!! This list is going up on my fridge! I am headed over to your article on building shelters for feral cats! We did this when we lived in our previous home as we had a MAJOR feral cat issue around there. We used styrofoam containers and they kept the kitties warm until we could catch spay or neuter and release or find homes for them which we did most of the time. I love this article! There are so many things we can all do! What a lovely post and so inspiring. We all need to see your gorgeous pictures (so Christmas-y) .I believe we should all live my 'Be the Person your Cat thinks you are" because I think I fail so often. We animal people need to stand tall. I LOVE all of these ideas! Especially the one about helping a house-bound senior with their pets. That's such a great idea and one that I've never thought of. I know they would feel so relieved knowing someone was giving their dog some extra exercise or taking their animals to get their nails cut or grooming. Love this post so much! Every one of your 31 suggestions is terrific. I'll definitely be sharing this on Facebook and on my website. Thanks for reminding us all that GIVING is the reason for the season! This is a great list! I need to sit down and plan some donations and ways to give. I like the idea of a meatless Monday. I can't quite bring myself to give up meat, but I feel guity eating it and would like to at least reduce my consumption of it. I absolutely love this list, it's perfect! I too try and do my best by living a compassionate life, and helping animals. I think many people believe it's too hard to help or aren't quite sure what to do. I'm sharing your list because I want as many people as possible to see how easy it really is. Not only are there great ways to help others, it does wonders for our soul. Fabulous post! Great list – I love the idea of posting one idea a day on social media. There are always things (even small things) we can do to help animals in need, and it's always great to have a reminder. Thank you. We are big advocates of cat adoption, but there are also some great additional ideas in here too, I particularly like the thanking shelter workers idea! Ah, yes, I have to not forget to make my donation to Jasmine's vet's pet food bank! This is an awesome list! I have some dog gear that I need to donate to the shelter. We recently donated a bed, supplements, toys and other things Mr. N doesn't use/need. Pawsome post! I'm thrilled to announce that we are in compliance with a good number of these. We just donated a ton of stuff to a shelter, TW always carries cat food in her bag when she goes out, we provide food for the TNR, and lots more. 18. Know the issues and get involved at the local and state level. Follow and advocate for humane legislation in your community and state.You could have stopped at "know the issues…" and that would have been enough! If more folks simply took some time to read up on training/advocating/etc/etc animals would have such a better go of it. Thank you for sharing so many amazing and compassionate ideas. Sometimes small changes can make a big difference. These are all great simple ways to help animals. I really have been thinking seriously about going meatless in 2018. I also like the idea of taking photos in shelters and sharing. I'll have to look into some of your tips. Really great ideas anyone can do. I'll be sharing this post as well. Thanks. I want to do so many of these! Where do I even begin?! I just got a new camera for Christmas and would love to take pictures of the adoptable pets for the holidays, that one is pretty close to the top of my list!! I love this list. I've got the veg thing covered for the last 28 years. One I'd add is buying Christmas gifts from silent auctions that benefit pet rescues. Wow, this is quite a list! If everyone did their part and did even just a few of these tasks, we'd have a much safer world for our animals. Thank you for such a fantastic post. I'll share it with others. Such an amazing list! Some of these I had never thought of, like taking photos of shelter animals. So easy for me to do and yet I haven't done it. This post is quite inspirational and perfect for this time of year. Even if each of us did only one thing it would make a huge difference. Wonderful ideas you have.I fully agree with an animal lover.All my pets were rescued especially, my feline siblings and daughters.Of course, I share anti-animal abuse posts and petitions in social media.I donate local shelters not only holidays but also birthdays and whenever I feel.I have seen how cruel people badly treat and abandon poor helpless animals.God bless you for being kind, spreading kindness and fight for the right of shelter animals.